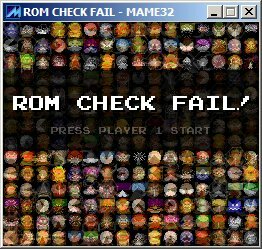 Three years ago I released ROM CHECK FAIL, and it’s haunted me for three years since. Not only is it a fantastic game and debatably the high point of my career, it’s also an idea crying out for further exploration, and a litigation timebomb. I want to do more with it, but I also want to retain ownership of the shirt on my back, the pants I sometimes wear, and the house they all live in. After much ponderance I’ve decided to set the idea free. I don’t mean free as in beer, since it’s freeware already. I mean free as in Free Software Foundation. Here, download the source code for ROM CHECK FAIL. To use it simply grab the game from my Games page, install it, extract the source file into game’s install directory, and edit away. You don’t need to compile it or anything, any changes you make to the game source file should be detected and picked up automatically the next time you run the game. I should warn you – this code be dragons. I wrote ROM CHECK FAIL over two and a bit weeks outside my fulltime job, so it really was just slapped together. Lowlights of particular note are my own atan2 function (because somehow I’d never discovered atan2), several virtual subclasses – and I use the word “virtual” to mean I never bothered to write the superclass, collision detection that works more often than I’d expect but less often than I’d like, repeatedly loading images from disk because it involved less typing, and the fact that the entire source code for the game resides in a single file. I’m so proud. If you’re looking for sample code, either to help you learn to make games or to evaluate my abilities as a programmer, then please, please look elsewhere. I think I’m all out of disclaimers, and all out of excuses for lingering. Please take this file somewhere crazy. Be awesome, then tell me all about it. Goodbye ROM CHECK FAIL. Have a good life. Excellent. With all the fuss with Jameson, I think it’d be great to see some of your other works getting some attention. ROM CHECK FAIL is among my staple of games that I keep socked away on my home theater PC to show off to visiting geeks during a party. You've done some excellent work here – extra kudos for open-sourcing it. Bahaha even I am a less sloppy programmer. I always assumed your code for everything would be shining with an ethereal glow or something. Seriously though, you should try writing deliberately sloppy code some time. It’s surprisingly liberating. Thank you. Do not worry about code quality, be proud of your gift to the community! Just yesterday, really, I was thinking about how I would love to be able to mod this game. I’d talked to you before about how certain characters seemed to work better than others or whatever, and I remember how afraid you were that this brilliant piece of work would blow up in your face some day. Never did happen, which makes me happy, but this is icing. I still play this game almost everyday. I’ve shown it to so many people. That’s some, uh, pretty unclean code you have there! Just too much use of drawImage! Anyway, I can’t think of much to add to it because the game is, naturally, a blast! Make sure you put a link to this post under “Games”! Have seen this game first in Computerspielemuseum in Berlin, Germany. Now I’m playing it at home. Thanks to the author for the awesome idea which really came to life! please help me decipher this. i really like this game and want to be able to access it easily or when i dont have internet connection.i really appreciate any help you can provide. i know the game fails to check ROM, but it should be able to do it multiple times. thanks in advance. 1 Pings/Trackbacks for "ROM CHECK YOURSELF"